Eating at uni is all about eating well but for not much money. 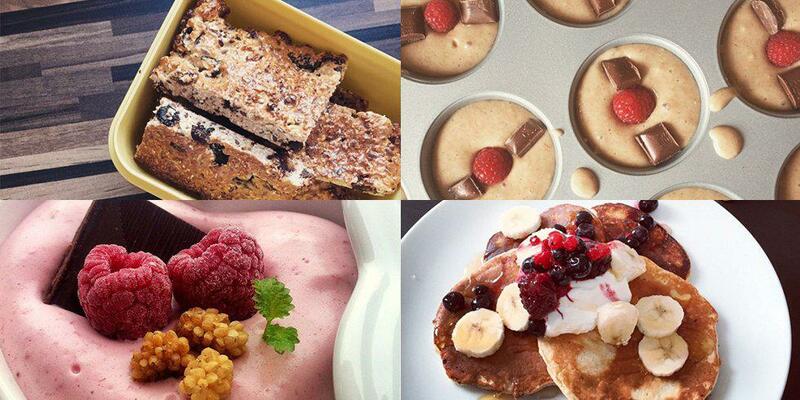 Here are 5 yummy meals that actually pack some nutritional punch and aren't expensive to whip up! Ramen doesn't have to mean bland and boring. 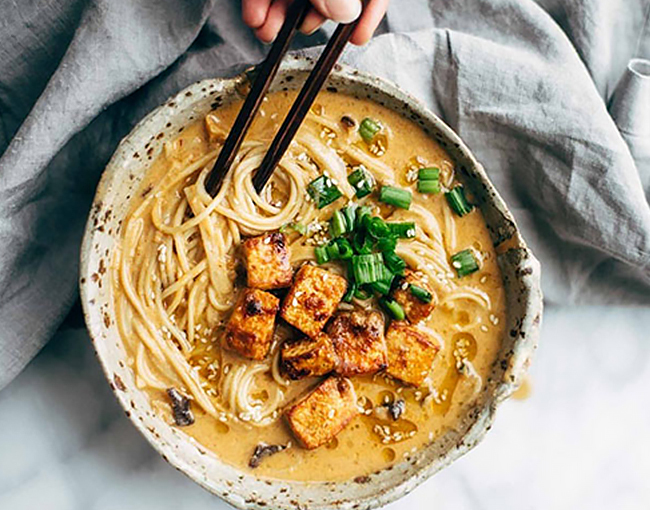 Pictured is an amazing homemade spicy Ramen with Tofu which isn't necessarily an authentic recipe but it sure tastes amazing. You could make this with chicken or frozen prawns if you're not a fan of tofu. You can also either buy your miso paste ready made if you're not an absolute Mary Berry in the kitchen (plus, it's probably a lot cheaper and you can use it over a few different meals too!). All you need for this recipe is a cheap packet of instant noodles, tofu or chicken, a couple of eggs, spring onions, chicken stock, soy milk and mushrooms. Fry off your tofu in your miso paste until it's golden and set aside. Now, make your broth by placing half of your miso paste on top of a fine sieve and use a spoon to dissolve the paste into your chicken broth and let it simmer with your mushrooms. Cook your eggs for around 7 minutes and your noodles according to packet instructions and serve! 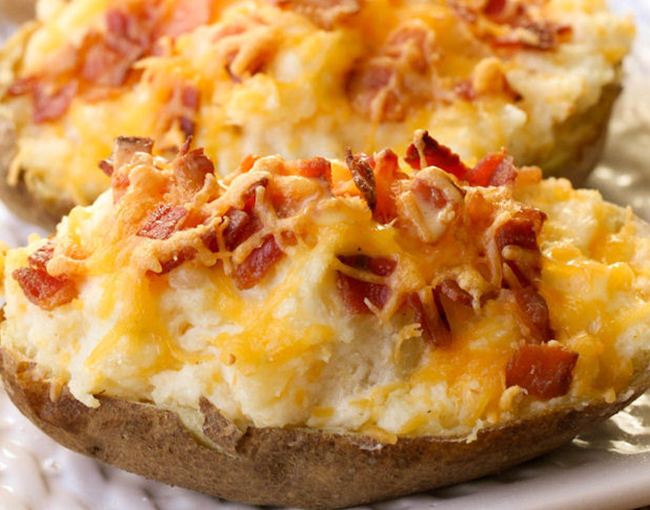 If you're in need of some serious comfort food, these Twice Baked Potatoes are perfect. 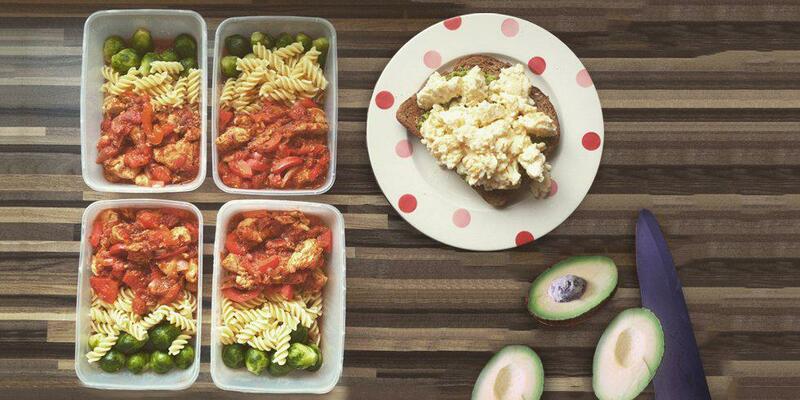 Why not serve with tuna or chicken for some added protein? These are so versatile so you can include whatever cheese and meat that you like best. 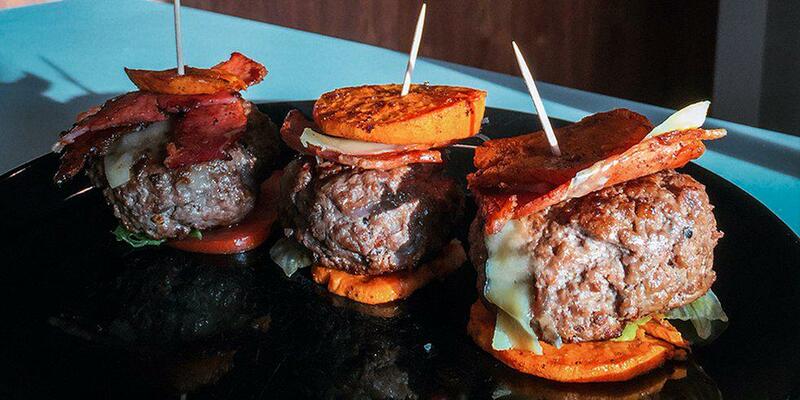 To make these, bake your potatoes as you usually would for around 60 minutes at 200 degrees. Let them cool for around 15 minutes. Cut them in half and spoon out the insides. Mix the insides up with sour cream, cheddar cheese, bacon, ham, spring onions, broccoli, anything! Then, place the mixture back inside the skins, sprinkle a little excess cheese and pop back into the oven for 15-20 minutes. Get all your vitamins and minerals in with a selection of amazing vegetables like courgette, bell peppers and red onions! 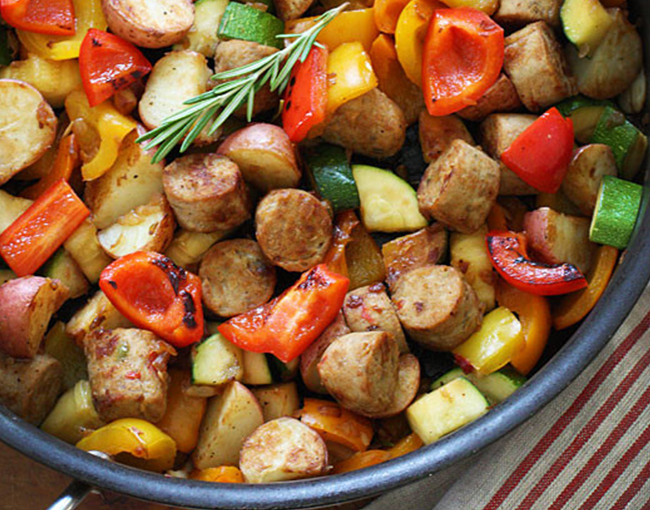 This is a super colourful and tasty dish with either chicken or pork sausages. Simple bake in the oven or fry in the pan with a little olive oil, rosemary, salt and pepper. There's a load of protein, fats and great carbs in this meal with the addition of all the vegetables. Find the original recipe here. A little one for the vegetarians and vegans out there and a tasty meal even if you're a meat eater! 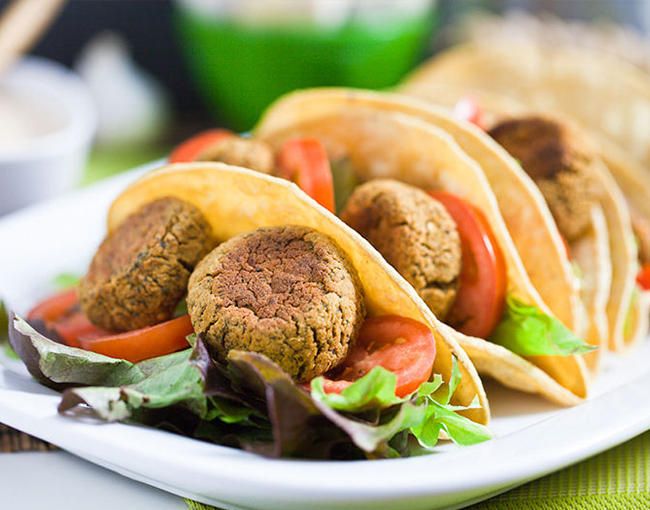 These Falafel Tacos are incredible. They're baked so this makes them so much healthier than your usual fried variety and they're packed with protein. Simply blend a can of chickpeas with coriander, 1/4 red onion, some garlic, lemon juice, dill, paprika, cumin and oregano and around 3 tablespoons of chickpea flour in a food processor and you'll end up with a dough like consistency. Scoop into small balls or patties, place onto a baking sheet and bake in the oven for about 20-25 minutes. The longer you bake, the crispier they'll be. Then, serve in taco shells with lettuce, tomato and guacamole! 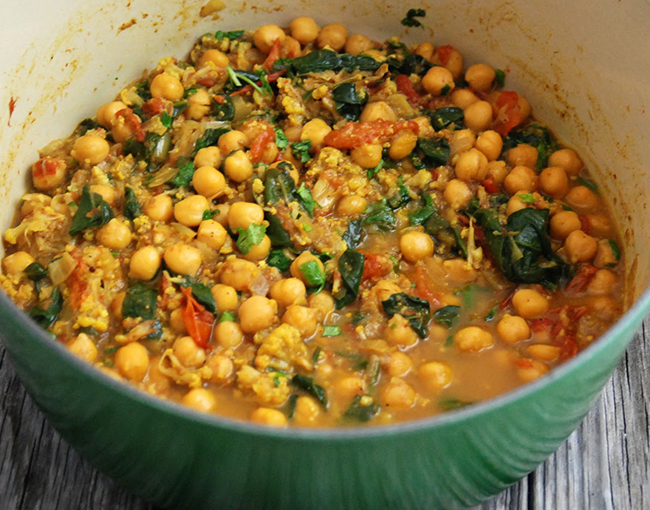 This Chickpea Curry is packed full of vegetables and is amazingly tasty and warming for the winter months. Roast cauliflower and cherry tomatoes in the oven with a touch of olive oil, salt and pepper. Meanwhile, in a medium sized pot, heat oil and cook an onion until golden brown, add garlic, ginger, curry powder and some chilli. 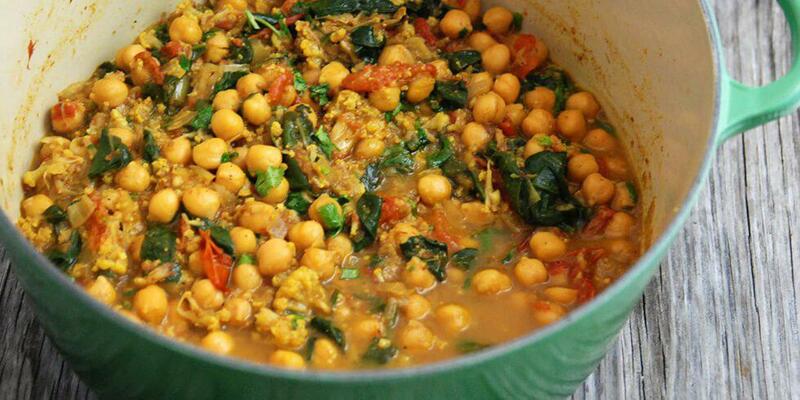 Add 2 cans of chickpeas, the roasted vegetables and some water until it reaches your desired consistency. Simmer for 10 minutes and season to taste. You can also add chicken, shrimp or white fish to this recipe if you like and it will be even more delicious. Serve with basmati rice and a yoghurt and cucumber dip.